Advanced Warfare takes Call of Duty almost fifty years into the future. A half century of weapons advancement has changed the face of warfare, giving rise to walker tanks, smart grenades, and exoskeletons. This last bit of tech has the biggest impact on the game, both in the single player campaign and multiplayer modes, giving your soldier superhuman capabilities. While you won't be giving Superman any competition, you will be able to jump ten feet into the air, perform boost-assisted dodges and slides, and access special exoskeleton capabilities such as shield and cloak. The exoskeletons inject a new level of excitement into the franchise without unbalancing the game or breaking the core gameplay that has made Call of Duty the premier shooter franchise in videogaming. If you've sat on the sidelines for the past iteration or two of the series, now is the time to (boost) jump back in. I realize that many of you will jump right into multiplayer without giving the campaign a second look, but I'm going to start by looking at the single player campaign - not just because the game recommends that you do, presumably to get practice with all of the exoskeleton's capabilities, but because I enjoy playing through the single player campaigns in shooters and I know that there are plenty of gamers who play Call of Duty games primarily for the campaigns. I was pretty disappointed in the Ghosts single player campaign, primarily because the story was ridiculous and the missions felt more like a disjoint collection of missions than a coherent campaign. The Advanced Warfare campaign more than makes up for that misstep. Let's begin with the story, which opens with Seoul under siege during a North Korean invasion. You play as Jack Mitchel, a young US Marine being literally dropped into combat for the first time along with his buddy Will Irons. Your dropship introduction to combat lets you know from the get-go that you're witnessing the future of warfare, a fact soon reinforced as you get your feet wet with your exoskeleton. The exoskeleton is a valuable tool for moving across a bombed out cityscape - you can leap across gaps that once were floors within a building or safely drop down to the street below. The opening level is just a prologue to warfare in the future, and the story soon moves beyond the conventional nation-state conflict to the future of terrorism and corporate warfare waged by private military corporations, or PMCs. The story raises some provocative and scary warnings about the future of technology, and it will have you thinking about those points long after you've completed the campaign. Overall the story is a believable tale of a future history in which too much power is given to PMCs and the people who lead them, and the story's impact on the player is increased by several factors. First, it helps to play the game as a single protagonist. While this may require a little suspension of disbelief (how often is one soldier involved in every critical confrontation in a worldwide conflict? ), it does keep the cast of characters more manageable and makes the story more personal. Next, the missions support the story, rather than the story serving as a way to tie together a collection of disjoint missions. It sounds like a simple concept, but it's important for immersion and enjoyment of the campaign and Advanced Warfare gets it right. Next-gen tech certainly helps with the immersion factor - the cutscenes in the campaign are incredible. They are so seamlessly integrated into the action that I often thought that I was still playing the game for a moment before I realized that I was watching a scripted event that had taken over. The technology used to capture the actors' actions and expressions results in cutscenes that are at times hard to discern from actual video and as a result the performances have a huge impact on the story. Which leads us to the role of the PMC Atlas Corporation's CEO Jonathan Irons played by Kevin Spacey. Spacey approaches the role with the same immersion and intensity he does with all of his film work - he doesn't simply mail it in because this is a video game. 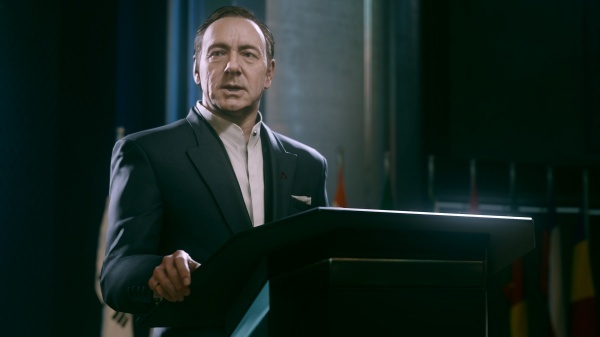 I was so impressed with his performance and the way that he made Irons feel like a real person rather than a videogame character, that I recommend playing the campaign just to watch Spacey in action. The single player campaign isn't enjoyable simply for its story and actors' performances, though, the missions are fun to play as well. You'll have plenty of chances to control advanced weaponry, my personal favorite being the walking mech arsenal known as the AST, but the levels that I enjoyed the most were those that opened things up for you. Call of Duty campaigns have always been linear affairs, and while the latter entries in the series pushed the walls back a little bit, you've always been contained to a small and managed playground. 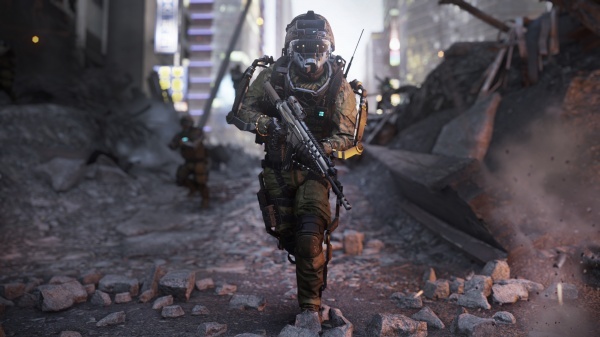 While Advanced Warfare's campaign levels are still linear, some of them are more open than any level in a Call of Duty game. This is the first entry in the series in which I actually felt that I had some freedom in deciding how to accomplish some of the objectives, and that replaying some of the missions could result in a different experience the second time through. Another feature of the campaign that warrants mention is that is the progression system. The game will track a number of your statistics across missions, number of kills and headshots, intel found, that sort of thing. When you reach a milestone in one of these categories you earn an upgrade point that you can spend to upgrade your exoskeleton and your abilities. You can increase your health, reduce weapon kickback, add additional grenade slots, and a number of other things. What's more is that these upgrades not only carry through your campaign, they are persistent across campaigns. You can play through the campaign at the regular difficulty level and purchase a number of upgrades as you do, and then take on a higher difficulty level with a stronger soldier. It's a great idea, not just for the upgrades but because I really liked seeing the statistics that are tracked during the campaign. How else would I have known that I had to score hundreds of kills to complete the campaign? Before moving on to the multiplayer, I should answer that question that's always on the mind of gamers looking to buy a game: how long will it take to complete the campaign? I'd say that an average player playing at the regular difficulty should get about eight hours of gameplay out of the campaign on the first play-through, but of course your mileage may vary. There are a number of gamers who enjoy the single player campaigns in Call of Duty games, but find the multiplayer modes too challenging or intimidating. If you're one of those gamers, then you should still stick around while we move our attention to the multiplayer game because I'm going to start with a look at the Combat Readiness mode. This is the perfect mode for players completely new to Call of Duty multiplayer or for those who are simply looking for a little multiplayer fun here and there without the need to worry about being little more than stats fodder for high level players' kill to death ratios. Combat Readiness is a true "jump in and play" mode. You don't have to spend any time trying to figure out how to put together your loadout because not only are you provided with a set of loadouts designed to support different styles of play, custom loadouts aren't even allowed in this mode. Pick your loadout based on whether you want to try a "run and gun" style of play or play in a "support" role, or simply select "balanced" and go to it. Since everyone selects from the same loadouts, everyone is on an equal footing weapons-wise and you don't have to worry about bringing a level one peashooter into a match filled with high level assault weapons packed with attachments. Another fun feature of this mode is that players are given kill streak perks at random without the need to build up long a kill streak first. If you never get to play with all the various kinds of aerial strike, death-from-above kill streak perks, here's your chance to have some fun with them in a multiplayer match. In Combat Readiness mode you don't even have to worry too much about highly skilled players jumping into the mode simply to get their griefing jollies - Combat Readiness mode will identify dominating players and restrict their access to the mode, locking them out of the game for 24 hours. Combat Readiness is a great mode for learning and for some pure multiplayer fun, but it would also be nice to have something similar to this mode that would help gamers learn more about loadouts and weapons and such. Jumping into multiplayer straight from Combat Readiness can still be a little intimidating, and new players are still forced to take their lumps from higher level players until they can level up enough to unlock the gear to compete on a more equal footing. However, there are a couple of features that help mitigate this a bit. The first is that the game provides a few pre-made loadouts similar to those found in Combat Readiness mode. When you start out, there's not much you can do with your custom loadouts as you won't have unlocked enough weapons, attachments, or perks to even hit the cap on your loadout. Instead you can simply pick "run and gun" and get right to running and gunning. The other feature is the loot drops. You earn loot drops during matches, and you don't have to dominate a match to earn one - it seems that they can even be earned while you're mired in a death streak. After the match you can open your loot crates and see what's inside. Loot includes gear that you can use to customize the look of your multiplayer character (known as your operative in the game), short-term match bonuses (like double XP, woot), and advanced weapons. Taking a page from MMOs, the loot in the game comes in different levels of rarity - Enlisted, Profession, and Elite - so picking up an Elite weapon when you're a low-level player can be a godsend. And if you get something that you don't want, say a sniper rifle when you prefer the intimacy of a shotgun, you can trade your loot in for experience. Sometimes you won't know if you want to keep a weapon or trade it in for experience until you try it out, but it would be bad if you found out that you hated a weapon the hard way during a match. That's where the Virtual Firing Range comes in. You can visit the range between matches to test out your weapon on a variety of moving targets and see if it's to your liking. As I mentioned, loot includes gear and clothing for your operator. Advanced Warfare gives you more options to customize the look of your operator than ever before in a Call of Duty game. And since it's hard to appreciate the looks created by other players when in the midst of a multiplayer match, you can check out all of the other players in the pre-game lobby, rotating them to check out their custom exoskeletons as well. The player browsing also extends to loadouts, so you can see what weapons other players are using. While on the topic of loadouts, I should mention that Advanced Warfare increases the Pick-10 system (basically the cap on the number of perks and weapons attachments you can pick for your custom class) to a Pick-13 system. The increase comes with more customization options, including the capability to customize score streak awards so you can, say, turn the remote turret award into a rocket turret award instead. The Pick-13 system also extends to exoskeleton abilities. Boost abilities - jump, slide, dodge, etc. all come for free for all players, but you can also equip capabilities like shielding, health boost, and foot speed. Exo abilities are pretty powerful, so to keep them in check they are battery operated, and once you've depleted your battery it takes a long time to recharge it (except if you die, of course). If you've played Call of Duty games recently, most of the twelve modes in Advanced Warfare will be familiar to you. Kill Confirmed (in which kills don't count until you collect a downed player's dog tags) seems to be a part of the regular Call of Duty lineup now, and it's good to see that it is. Momentum is a returning mode of sorts in that it's inspired by World at War's War mode. It's a tug of war of sorts in which five capture points exist, but only one is active at a time. Momentum builds as your team captures points and scores kills, making it easier to capture the next point. Lose a point, though, and that momentum is reset. 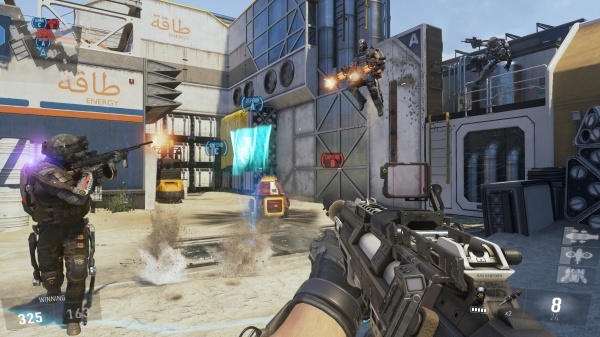 Uplink is a new mode in Advanced Warfare, and it's such a blast to play that it will probably be a staple of future Call of Duty games. Two goals are placed on opposite sides of the map and a satellite drone is dropped onto the map. Each team competes to grab the drone and bring it to the opponent's goal, with one point scored for throwing the satellite through the goal and two for jumping through the goal with the satellite in hand. The player carrying the drone can't shoot while carrying it, but can pass it to other players, which makes passing the drone to a pursuing player and then shooting him while he's suddenly struck with the drone a valid and effective tactic. The game includes thirteen core maps, some of which include dynamic features. For example, Defender, which is set at the base of the Golden Gate Bridge features a tsunami that comes in and floods a portion of the map, and Riot, set in an abandoned prison which includes prisoner control systems that are still active. All of the maps are designed to take advantage of the vertical nature of the gameplay that's created by the exoskeletons, but there are still plenty of indoor areas where boost jump won't help you at all. 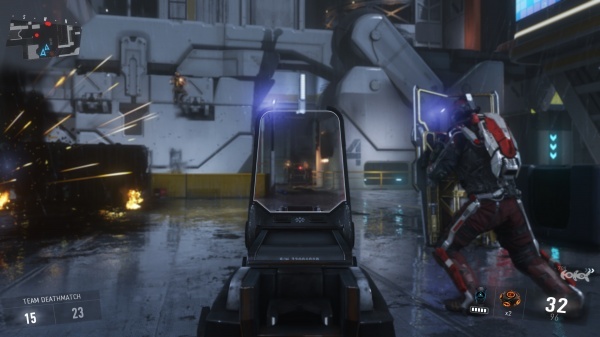 The exoskeletons make the multiplayer game play faster than previous Call of Duty games. Players can scale obstacles, reach high points, and cross the maps relatively quickly. You'll need to develop the skills to take out other players in the middle of a boost jump while you're boosting yourself, and cover and elevated firing positions are not as safe as they used to be. It's all a lot of fun, but it will take a little adjustment to get used to the new play style. 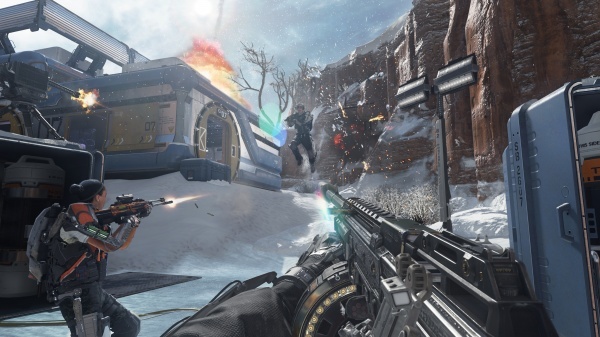 Multiplayer gaming in Advanced Warfare isn't all competitive, there's a co-op mode as well. In co-op, one to four players (yes, it can be played solo) work together to survive as long as possible in what it is essentially a horde mode. To keep things interesting, the game randomly changes the objective between waves of attackers, so you'll often have to do more than simply survive. Enemies get progressively more difficult, and you'll need to make it far enough in the initial maps to unlock the more challenging maps. 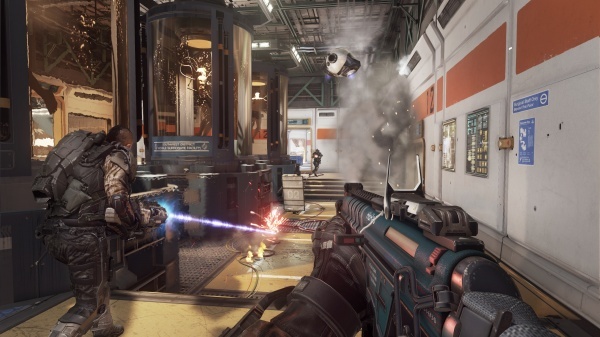 Co-op mode is fun in Advanced Warfare, and is the kind of mode best played with friends looking to get farther than their previous best. Overall, Advanced Warfare delivers a complete and enjoyable Call of Duty experience. The single player campaign is excellent, with an engrossing story and enjoyable missions. Multiplayer delivers the Call of Duty experience, including lightning fast frame rates and responsive controls, but adds a whole new layer of challenge and excitement with the exo abilities and boost-assisted maneuvers. This isn't simply an annual release of a long-running franchise; it's an exciting new chapter in the Call of Duty saga. Final Rating: 90%. 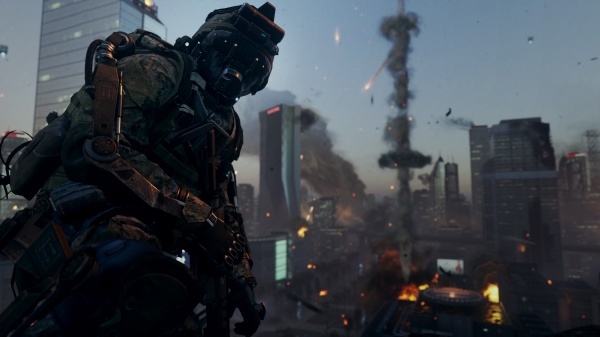 Advanced Warfare gives the Call of Duty franchise a big boost.